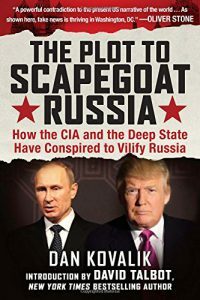 Kovalik is author of the just-released book The Plot to Scapegoat Russia: How the CIA and the Deep State Have Conspired to Vilify Russia. He teaches international human rights at the University of Pittsburgh School of Law. See the book’s forward by David Talbot, the founder of Salon.com. “This doesn’t mean Russia and Vladimir Putin are beyond serious criticism. No one is. But what’s happening here is clearly a major effort to demonize Putin. This facilitates several agendas: Painting the U.S. as a benevolent force on the world stage rather than critically assess the damage its regime change wars have caused. It is used by the establishment of the Democratic Party to justify their loss to Trump and lack of a serious affirmative program. And it facilitates the continued militarization of U.S. foreign policy and the continued dominance of the Military Industrial Complex.